3,000 children have been given free books and literacy-boosting activities at James Cook University Hospital since 2015 as part of our Middlesbrough Reading Campaign, in partnership with the South Tees Hospitals NHS Foundation Trust. Now thousands more children who are admitted to or visiting the hospital have the opportunity to enjoy a special story pack, which have been re-launched with a selection of new books. The packs are distributed to children by the hospital’s therapeutic care volunteers and have been created for four age groups: younger children, seven plus, 10 plus and 12 plus. Each includes a story book, including stories from popular authors such as Jill Murphy, Michael Morpurgo and Julia Donaldson, an activity book, a Middlesbrough’s Best Books leaflet and a pack of pencils. The project aims to inspire families to read together during their stay and help boost children’s literacy skills. “We have been delighted with the response to our story packs at James Cook University Hospital, which have brought families comfort during what can be an anxious time. We are looking forward to giving more children brilliant books to help them continue their reading journey at home. 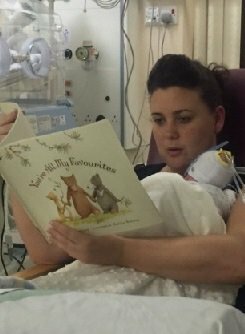 The Middlesbrough Reading Campaign is also supporting parents of babies on the neonatal ward at James Cook University Hospital. In partnership with the charity Bliss, parents of premature babies also receive special packs to promote reading and singing to help them bond with their newborn babies. The neonatal story packs include a copy of Guess How Much I Love You, tips on supporting babies’ literacy development and information about libraries in Middlesbrough. Find out more about the Middlesbrough Reading Campaign.